There has never been a better time to start your own business. And yet false beliefs and startup myths are putting young people off exploring this potential career path. One of North America’s leading mentors, Sean Wise, is here to crush those myths and help you go from wantrepreneur to entrepreneur. Wise is a professor of entrepreneurship at Ryerson University in Toronto, Canada – home to the #1 university-based incubator in the world. He specialises in helping emerging and high-growth potential organisations accelerate their business and turn a profit. Bring your burning questions and big ideas for this interactive and thought-provoking presentation on the promising state of global entrepreneurship. 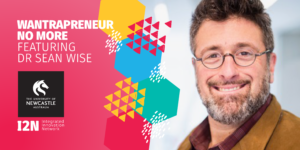 As a celebrated business speaker and one of North America’s leading mentors with an unmistakable passion for business, Dr. Sean Wise specialises in helping emerging and high growth potential organisations jump on the trajectory and turn a profit. An expert on startups and venture capital, he uses this knowledge in his various roles as a university professor, bestselling author and partner at Ryerson Futures – a seed stage venture capital fund and technology accelerator. Dr. Wise has published five books and more than two dozen peer-reviewed research papers and case studies of high-growth startups. Dr. Wise spent five seasons as a consultant for CBC on the mega-hit venture reality show Dragon’s Den before moving in front of the camera as the host of The Naked Entrepreneur, which airs on the Oprah Winfrey Network. In 2014, Dr. Wise was named Entrepreneurial Mentor of the Year by Startup Canada. A professor of entrepreneurship at the Ted Rogers School of Management at Ryerson University, Wise majored in engineering and economics at Carleton University and earned a law degree and MBA from the University of Ottawa. In 2012, he received his PhD from the Adam Smith Business School at the University of Glasgow. UON is proud to be able to bring this event in partnership with the Sydney School of Entrepreneurship (SSE), an unprecedented new collaboration between 11 NSW universities and TAFE NSW. SSE is driving next generation Australian entrepreneurship. I2N is pleased to bring you this event as part of the Hunter Innovation Festival. UON is proud to be able to bring this event to you thanks to the NSW State Government’s Boosting Business Innovation Program.